The Epoch Times newspaper is currently running an editorial series called “The Dead End of Communism” that includes a detailed discussion of the diabolical, even Satanic, roots of Karl Marx, the father of communism. Looking at his writings in detail, the authors document how his goal was “to enact a sort of vengeance against heaven.” Contrary to his “progressive” profile, Marx hated humanity and life on earth. His appeal was that he promised a heaven on earth. But it turned out to be hell for those living under it. Communism has killed more than 100 million people, and millions more are at risk of death. The people of South Korea and other countries are currently in the crosshairs of Communist North Korea’s nuclear weapons program. The communist ruler, Kim Jong-un, has even threatened America with a nuclear attack. The North Korean nuclear weapons program was assisted by President Bill Clinton’s administration, in the name of stopping it, and the Obama administration did little to contain it. It’s likely that former President Barack Obama informed President Donald Trump about this growing problem, and that this helps explain why Trump has been so concerned, even preoccupied, with the North Korean nuclear threat since he took office. A serious examination of the real Russia problem can be found in The Epoch Times series marking the 100th anniversary of the Russian Revolution. President Trump recognized that Russia has not changed significantly from the old Soviet days when he authorized a U.S. military strike on Russian client state Syria in response to its alleged chemical weapons attack on innocent civilians. Russia’s relationship with Syria and Iran represents the “Red Jihad” that has existed since the days of Lenin, when the founder of the Soviet state urged the “oppressed” Muslims to join in a global campaign against the West. Meanwhile, communism is very much alive and doing well in Latin America. The communist rulers of Venezuela are in the news for totally mismanaging their once-healthy economy and persecuting their own citizens. And Washington Times investigative journalist Martin Arostegui writes about how Colombia’s FARC communist guerrillas are still in the business of dealing drugs and spreading terrorism. It looks like “peace” in Colombia is similar to the “100 percent” elimination of chemical weapons in Syria. As President Trump attempts to rally the nation in the face of the North Korean threat, we can see how communism is also very much alive on the streets of America. Communist groups have organized a tour covering nine U.S. cities, from April 4 through the 16th, to mobilize against the deployment of the U.S. Terminal High Altitude Area Defense (THAAD) missile system in South Korea. THAAD is designed to deter a North Korean nuclear attack. It’s the one thing Obama set in motion to help defend South Korea. The main sponsor of the anti-THAAD tour is the Party for Socialism and Liberation (PSL), a self-described “revolutionary Marxist party in the United States,” and its front, Act Now to Stop War & End Racism (ANSWER). Remember Kucinich? His Fox News bio notes that he “conducted an exclusive interview with Syrian President Bashar al-Assad to discuss the allegations of the use of chemical weapons alongside FNC’s Senior Foreign Affairs Correspondent Greg Palkot.” That was aired on Special Report with Bret Baier back in 2013. 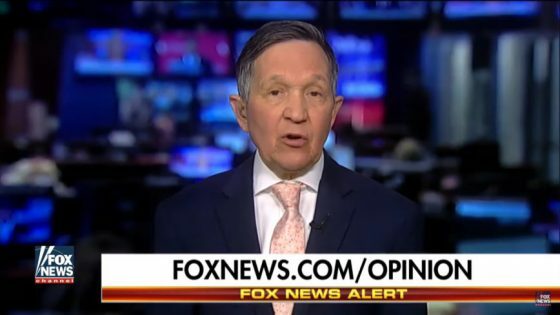 After the recent allegations of a chemical attack, Kucinich was back on Fox News saying he didn’t think Assad was behind it. It’s fascinating that Kucinich is now a leader of the campaign against defending South Korea from a communist attack. BuzzFeed, described by Wikipedia as “a liberal American internet media company based in New York City,” is in the “donor spotlight” at the national news museum in Washington, D.C., known as the Newseum. The “honor” demonstrates how the media have changed and how low they have sunk. A virtual property of Comcast Corp.’s NBCUniversal, BuzzFeed has been a cog in the anti-Trump media machine. The “donor spotlight” designation is strangely appropriate, since BuzzFeed disclosed the so-called “Trump Dossier” used by the intelligence community to smear President Trump. “The allegations are unverified, and the report contains errors,” the social media site acknowledged while spreading the dubious claims. The “Trump Dossier” released by BuzzFeed was concocted by a former British intelligence agent, and turned over to James Comey’s FBI. Around that time, in July of 2016, notes columnist Lawrence Sellin, the FBI launched its investigation of the unproven connections between the Trump campaign and the Russians. Comey told Congress that the Bureau has been actively investigating possible links between the Trump campaign and the Kremlin since “late July” of 2016. For raising necessary questions about this arrangement, Napolitano was reportedly banned from Fox News. He is the modern-day John Peter Zenger. However, his March 16 column, “Did Obama Spy on Trump?” is still on his website and looks increasingly relevant every day that passes. There’s no money in doing so. It would just be the right thing to do. It would be a reaffirmation of First Amendment values. President Donald Trump is usually a fan of Fox News, but his opinion may now be changing. 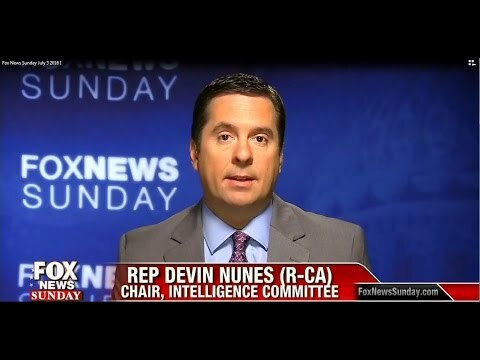 Fox News has been caught misrepresenting its own interview with Rep. Devin Nunes (R-CA) on the subject of alleged wiretapping of President Trump, in order to make Trump look bad. The cable channel also threw one of its own commentators, Judge Andrew Napolitano, under the bus for highlighting a possible British role in gathering intelligence on Trump and his associates. But if you listen to the video clip or read the transcript, that is not what Nunes really said. Nunes actually said, “…the President doesn’t go and physically wiretap something. So if you take the President literally, it didn’t happen.” But Trump has referred to “wiretap” in quotes, to refer to surveillance. Nunes went on, “I think the concern that we have is that are—were there any other surveillance activities that were used unmasking the names” (emphasis added). The media highlighted FBI Director James B. Comey’s statement at Monday’s hearing that the FBI and the Justice Department had “no information that supports” President Trump’s tweets about wiretapping. But where could these “other surveillance activities” have originated? We know that a former British intelligence agent was involved in gathering “intelligence” against Trump in the form of the fake “Trump Dossier,” and was paid by donors associated with the Hillary Clinton campaign. Parts of that “dossier” were passed on to Trump by the U.S. intelligence community. As we note in our special report, “A Watergate-style Threat to the Democratic Process,” it is well-known that the British NSA, known as GCHQ or Government Communications Headquarters, collaborates with the NSA. In fact, a declassified document on the NSA’s own website confirms NSA/GCHQ “collaboration” dating back decades. Fox News senior judicial analyst and commentator Judge Andrew Napolitano said his sources confirm there was such an arrangement in the matter of the “wiretapping” of Trump and/or his associates. The phrase, “knows of no evidence,” does not suggest any independent investigation of his information. In the face of this evidence of collaboration, NSA Director Mike Rogers tried to insist at Monday’s hearing that the NSA never asked the British to conduct surveillance of Trump. So why did the intelligence community accept and circulate the Trump dossier? In a letter to Comey, Senator Charles Grassley (R-IA) noted that not only was the former British intelligence agent Christoper Steele “creating these memos as part of work for an opposition research firm connected to Hillary Clinton,” but that The Washington Post had reported that the FBI had reached an agreement a few weeks before the 2016 presidential election “to pay the author of the unsubstantiated dossier alleging a conspiracy between President Trump and the Russians, Christopher Steele, to continue investigating Mr. Trump” (emphasis added). At the House Intelligence Committee hearing on Monday, Rep. Andre Carson (D-IN) was still quoting from the discredited Trump dossier. Although Comey confirmed to the House Intelligence Committee that the investigation into the Trump campaign’s alleged relationship with Russian officials continues, there was no firm commitment to get to the bottom of the source (or sources) of the leaks to the media that are designed to damage the Trump administration. As we argued in our column, “Investigate and Prosecute the Press,” there is a procedure to get to the bottom of at least one of these leaks. That is, to subpoena Washington Post columnist David Ignatius, the recipient of the illegal leak of the classified information naming or “unmasking” Michael T. Flynn. All of this leaking is illegal, a violation of the Espionage Act. It is a felony punishable by up to 10 years in prison. Jeff Bezos, the owner of The Washington Post, has a financial relationship with the CIA and the NSA through the provision of computer cloud capabilities. Rep. Trey Gowdy (R-SC) was unable to get exact figures from Comey or Rogers on the number of people at these agencies able to “unmask”—and therefore leak—a name. Such a number is absolutely vital in any identification of the leakers. Comey did admit that the heads of the intelligence agencies and various Obama White House officials could have acquired access to unmasked names. But as Spicer noted at the White House press briefing, Comey would not talk about any discussions he may have had with President Obama on the matter. It looks increasingly like any serious investigation of the illegal surveillance and leaking will have to be led and conducted by Rep. Nunes. But in going forward, it appears that the Fox News Channel has decided not to pursue the line of inquiry already opened up by one of its own commentators, Judge Napolitano. Predictably, there are now demands that Fox News fire its senior judicial analyst for offering his own informed opinion based on the facts and his own sources of information. Ben Shapiro is wickedly smart and incredibly funny. Daily Wire Editor-in-Chief Ben Shapiro had Fox News host Leland Vittert laughing so hard he couldn’t remember what question he wanted to ask. It was epic. The whole conversation revolved around foreign policy and how Donald Trump would approach it vs. Hillary Clinton. Hilarity ensued. Well, America loses. To call this election cycle a dumpster fire is far too cruel to dumpster fires, which at least destroy garbage rather than making them president. The problem here is that every attack that Hillary leverages against Trump on his lack of foreign policy knowledge, experience and basic common sense can be doubly true of her. He can basically reverse everything; she attacked him in that speech on his Russian policy; this is a lady who handed a reset button to the Russians and helped define a policy that handed Syrian control over to the Russians as well as Ukraine over to the Russians. Every time she attacks Trump, with regard to, for example, his policy in the Middle East on ISIS, she helped create ISIS with her Iraq and Syria policy. When she says that he can’t be trusted with the nuclear button, first of all, her own husband apparently lost the nuclear football when he was President of the United States, according to Buzz Patterson. This is the same lady who set up a private server that made America’s national security secrets vulnerable, specifically for her own personal self-aggrandizement. The problem is that only Hillary can make Trump look like a legit candidate, and only Trump can make Hillary look like a legit candidate. I think that what you’re looking at right now is Donald Trump is running to Hillary’s left on half of her foreign policy and she is in an uncomfortable position because the truth is that she was actually in some areas very hawkish and in some areas very dovish when she was Secretary of State. And now she is having to run to Trump’s right in a time when Bernie Sanders is running hard to her left. It puts her in a very difficult position on foreign policy, and he, no one expects him to even be mildly coherent on foreign policy; he’s so wildly all over the place; he’s throwing the kitchen sink at her. As far as personality types, when you say there are two different types of personality, I think that’s kind to both of them; I think that Donald Trump has the personality of the drunk uncle who doesn’t drink and Hillary Clinton is more robotic than anybody in the history of presidential politics. You can almost hear the “beeps” and the boops” emanating from her mouth every time she talks. Sadly, in the end the lack of foreign policy competency isn’t funny and America loses. But Shapiro has an incredible wit and calls it like he sees it. Foreign policy may not dominate this election, but it should. It’s that serious and that deadly an issue. Paul Manafort is the new head of Donald Trump’s campaign. A longtime Washington insider and heavy duty lobbyist for third world dictators, Manafort appeared this morning on Fox News Sunday and inadvertently let slip some revealing truths. WALLACE: Wait, because I think this is interesting. You’re saying that you’re working with the Senate majority leader, who to a lot of the grassroots is a symbol of the problem? MANAFORT: We’re working with party officials and that was an example on Saturday where we could have — we won the state. We could have gone in there and tried to be disruptive as Cruz does in these states. 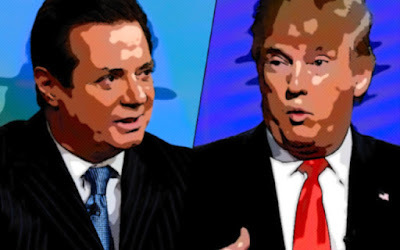 Manafort’s lobbying firm has been termed “the torturer’s lobby”, having represented Filipino dictator Marcos, Angolan guerrilla leader Jonas Savimbi, ousted Ukrainian president and Putin ally Victor Yanukovych, to name but a few. Yes, Donald Trump would be vastly superior to Hillary Clinton, because a malfunctioning pencil sharpener would be vastly superior to Hillary Clinton. But anyone expecting Trump to fight the McConnells and Ryans and the Chamber of Commerce is going to sorely disappointed. Trump has surrounded himself with Beltway cronies, lobbyists and insiders. He is a longtime Democrat and liberal. That is what he is and will always be. Caveat emptor. Senator Bernie Sanders (I-VT), the so-called “democratic socialist” running for president as a Democrat, made a surprise appearance on “Fox News Sunday” with Chris Wallace. But there was no discussion of what “democratic socialism” is or how it may differ from the socialism, say, of the old Soviet Union. It was a blown opportunity to educate the American people about the Democratic Socialists of America (DSA), the largest socialist organization in the United States and the principal U.S. affiliate of the Socialist International. Wallace also didn’t question Sanders about his volunteer work on a pro-Stalin Israeli kibbutz. Wallace was more than “fair” in this interview, referring to Sanders only as “senator” and ignoring his commitment to so-called “democratic socialism,” whatever that may mean.